Rainbow Sugarcraft: New Arrival for Cake Decorators! New Arrival for Cake Decorators! This georgeous Chocolate Ganache Mix is a cake decorating dream! It is time-saving, silky-smooth mix of cream and chocolate that can be piped or used as a filling - ideal for cup cake decorating. 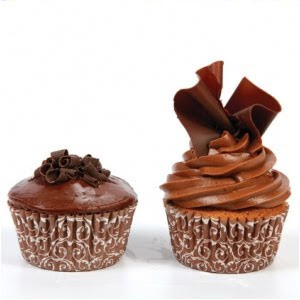 We now also have some super Designer Cup Cake Cases which are perfect for Modern Wedding Cakes. Whip up something quick but impressive for unexpected guests. With Chocolate Ganache Mix it's easy to make a gorgeous last-minute Wedding Cake filling. Always keep a couple of packs in your cupboard, just in case! Create tasty and original gifts. Chocolate Ganache Mix is ideal for making quick and easy chocolates that make great after dinner treats or unique wedding favours. Best Wedding Cake Sword for 2010!